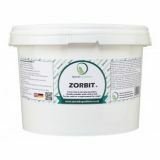 Zorbit (also called N-Zorbit) is a tapioca maltodextrin derived from tapioca that has been specially designed to have a very low bulk density. A very fine powder, it is readily soluble when cold or hot. It becomes a manipulable powder when mixed with oil (2 parts ZORBIT to 1 part oil) and dissolves completely on contact with any aqueous medium. Mix with fats and oils to make a powder. For example: Create a white chocolate powder to garnish desserts or to coat truffles, or turn olive oil to powder and sprinkle over salads. Zorbit is a carbohydrate obtained from cornstarch molecules, in this case, those of tapioca, which have been broken down. It has low sweetening power and does not add calories. It is employed as a bulking agent, but can also absorb oils. Used in the food industry in the preparation of beverages, dairy products, candies, soups, and so on. This product is primarily used to increase the volume of dry mixes. 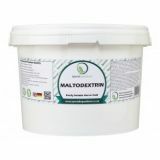 In addition, this bland tasting maltodextrin functions excellently as a dispersant for dry ingredients in low solids preparations. Great for making 'soil' both savoury & sweet. Can be also be used as a replacement for sugar in savoury ice cream or sorbet. 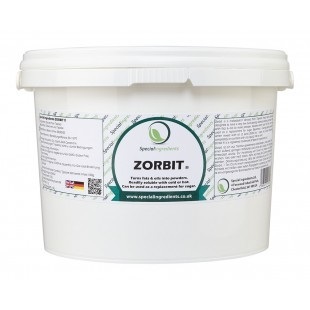 Zorbit is readily soluble when cold or hot. It becomes a manipulable powder when mixed with oil (2 parts Zorbit to 1 part oil) and dissolves completely on contact with any aqueous medium.